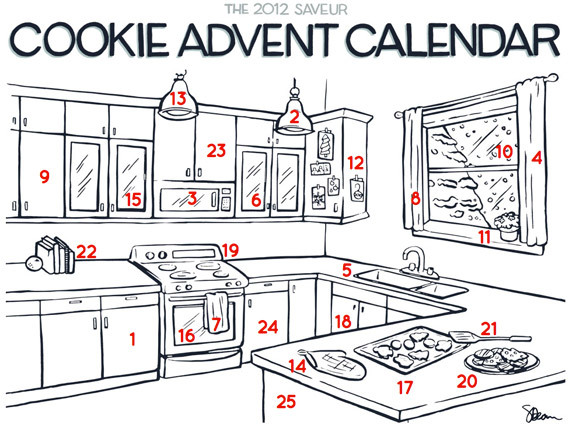 On December 1, the SAVEUR team launched the 2012 Cookie Advent Calendar. There is an interesting backstory to this project that I believe is worth telling. It highlights the importance of learning from a project that was not as successful as you hoped and having the courage to believe in a concept and try again by applying lessons learned from the first attempt. Last year’s version is an example of a large-scale project that was not a success. It was beautiful. It was clever. But it was under-visited and performed poorly. We poured a lot of labor into something that did not live up to expectations. Despite this setback, the SAVEUR team believed in the idea and made three intentional changes that has led to a more successful product this time around. All the cookie recipes were clickable on day one. Last year, we would “unlock” a new cookie each day so you could only view the cookie for that date or earlier. So it functioned much like a physical Advent calendar. It was designed to get readers to visit over and over again. But that did not happen. So this year, visitors can view all 25 recipes whenever they visit. Involve notable foodies/food bloggers. Instead of just going back to the SAVEUR archives to put together a cookie collection, this year SAVEUR invited people from different segments of the online food world. This broadened the reach as we were able to harness the collective social media power of the different contributors. The calendar rewards clicks. Last year we tried to introduce a sort of gaming element with clever animations. This year we made it much simplier. We started with a black and while illustration of a kitchen and visitors would click objects around the kitchen to access the recipes. But as they clicked a recipe, they would reveal pieces of a full-color illustration of the kitchen. Did the changes pay off? Well from December 1, 2011 till November 30, 2012, the first iteration saw a total of 19,312 unique visitors. As of the morning of December 12, this year’s version had already drawn an audience of 18,207 unique visitors along with referring 2300+ unique visitors to last year’s version. So it only took 12 short days to surpass the audience that we had in a year’s time with version 1. Note: Much of the content for this post was written by Helen Rosner, SAVEUR Senior Web Editor.